Beautiful fajitas loaded with chicken, salsa and bright crisp lettuce always make my mouth water. 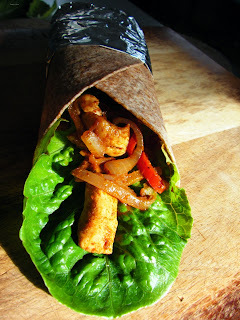 However, I was finding that my fajita offerings while tasty were sadly saggy and leaky and not very aesthetically appealing, after much research (which was no chore at all) I seem to have mastered how to roll a sturdy petty fajita without it collapsing. Wrap the tortillas in a tea towel and mist lightly with water from a spray bottle before warming them for 30 seconds in the microwave. This makes the tortillas more malleable for rolling and less likely to crack or tear. Fajita fillings need to be moist but not swimming in liquid as this will soak the tortilla and run out of the bottom, reduce everything down so you have intense flavours and just a little thick sauce. Also, be mindful of very large pointy chunks of filling that may tear through the tortilla when you try to roll them. Try shredding cucumber with a vegetable peeler instead of cubing, you'll still get the coolness of the cumber with out the pointy edges. Put the filling down the centre of the fajita, meat first then cheeses, salad and sour cream. Leave space at the edge of the tortilla as the filling will spread when you roll it, for the same reason do not overload the tortilla. Wrap them the fajita in foil. 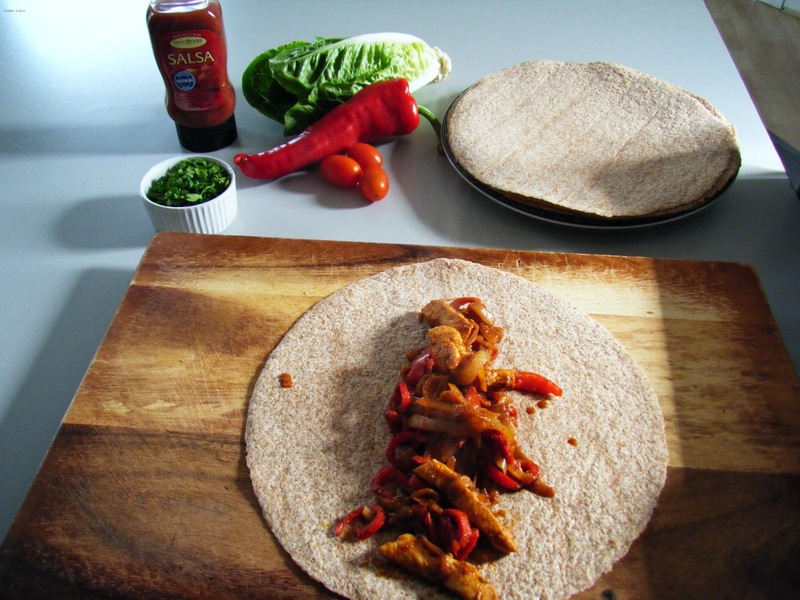 Assemble and wrap the fajitas just before serving as the heat from the filling will make the tortilla moist. Wrap foil around the bottom of the roll to keep it secure, this is great for little children sized hands that struggle to hold a full fajita. Have guests roll there own. Fajitas are a social dish, plate up all the components and place them in the centre of the table and allow your guests to serve themselves. Discovery Foods launches their new Instagram page this month to celebrate they are running a competition. Share your beautifully presented Mexican meal made with @DiscoveryFoods Instagram page and be in with a chance of winning an exciting prize worth £25 every week for four weeks. *Discovery provided their products for this post.